Clint Woodfin will be entering his 13th year teaching and coaching and his third year at James Clemens High School. Since 2002, Coach Woodfin has been a part of four successful and highly acclaimed high schools in the state of Georgia, all of which are noted for the their strong athletic and academic programs. He has taught all of the core social studies subjects, including Gifted and AP World History. He is certified in all of the social studies content areas including AP World History, health and physical education, interrelated special education, and has received his Georgia gifted endorsement. He recently has spent the past two years at Alpharetta High School, where he was a member of the special education department teaching Economics and Government. Coach Woodfin is also a member of the James Clemens athletic program as the assistant head football coach/offensive coordinator and head tennis girls coach. Coach Woodfin has coached football the past twelve years, five of those as an offensive coordinator. His career has included nine playoff appearances, three region championships, a state finals appearance, and one undefeated regular season. 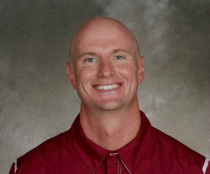 Coach Woodfin is a native of Decatur, Alabama where he graduated from Austin High School in 1997. He received his undergraduate degree from Auburn University in 2002 and his master’s degree in postsecondary education from Troy University in 2009. He is married to the lovely and former Briana Giglio of Lilburn, Georgia. Coach Woodfin and his wife also have a beautiful baby girl, Lily Cate, born September 20, 2013.